Raccoons Rags: Completion of the Jedi outfit. Almost. So the gaiters I mentioned in my last entry did go well after all. Here's how they look... it's not the greatest of pics, and I still need to sort them out where they 'join' the actual boot, to make it look more like a continuous boot-leg. But, it's turned out way better than I'd hoped for. Over the last few days I've been quiet because making the long-anticipated (by me if nobody else) Jedi robe - turned out to be a mammoth task. I used an incredibly soft viscose twill weave, which is so slinky it pulls out of shape when cut on the bias, and requires buckets of fray check to stabilise the edges because it frays like a b******d. It's a beautiful fabric though, and the end totally justifies the agony. SO MUCH SEWING in this. I did it all by hand and could have used a machine - but I often find machines are a bit to rough on delicate fabrics, and the overlock on a diagonal (bias) seam can make it as wavy as the deep blue sea. Also, I know these robes are not lined, and certainly not in a contrast fabric, but I couldn't help myself. I love the luxury of a lined dolly garment. Using a contrast fabric for the lining really gives it an opulent feel. The hood and sleeves are lined with the same brown as the outer, but the body itself has this nice beige-blond colour. Which should look good when the white garments have been tea dyed a similar shade. This post is just a teaser for today. I've sewed myself out and need a break, but I'll try to get Lucas dressed for some semi-official pics tomorrow. I need to tea dye the white items before it's really finished. One helpful hint as regards Fray check ( I use Fray Stoppa) Not only does it prevent really bad fraying, but with slinky or silky fabrics, it stabilises the edges and stops any bias-cut edges from stretching or going all wavy. It's a godsend in a project like this, even if you are lining it and enclosing all the raw edges. People have asked me why they should bother using it if everything's going to be lined. I've always said it makes your life a lot easier when sewing it all together. Nuuu! Don't cry! Honestly, you do things with your amazing dolly clothes that I could never get to grips with. 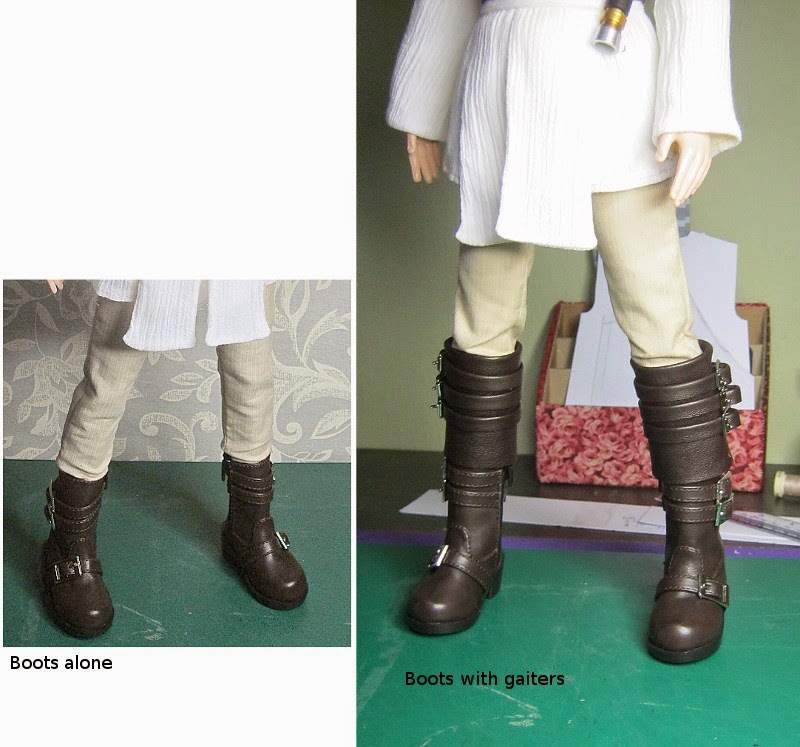 Love those gaiters... the boots look fab now and the cloak is amazing! Only problem I've found with fray stoppa on satin/silky fabric is that dries darker than the fabric so you have to be careful how you put it on.and not be too heavy handed .. cotton lawn is much more forgiving..... it's a great product though!! With the fray stoppa - it does do that on some fabrics, but luckily wasn't too bad on the viscose. I try to keep mine within the 1/4 inch seam allowance, and usually it's okay. I tend not to use actual silk, because I find it so hard to sew by hand. It's find if you keep within the 1/4inch seam allowance but stupidly I moved it so it wouldn't stick and managed to put the piece back down in the wet residue outside of the seam allowance... doh.... never mind we learn from our mistakes and at least I've plenty of material lol! !